How to build an exciting waterfront district around a core historic landmark? Carve a cluster of abandoned grain silos inch-by-inch to create the Zeitz Museum of Contemporary Art Africa. After Cape Town’s giant silos were abandoned in 2001, the city was faced with a void dominating its prime harborfront destination. British designer Thomas Heatherwick took to the task by painstakingly slicing the concrete shells into art galleries. The resulting cells range from small and intimate to cavernous, from square-cornered exhibition spaces suitable for displaying paintings and photographs to narrow cylinders appropriate for sculpture and multi-media pieces. The building opened in September 2017 and is testament to the city’s ingenuity. But though it offers its first visual punch via its architecture—a transformed towering complex of 42 conjoined silos—its purpose lies firmly in bringing new enthusiasm to Africa’s art scene. The expansive museum in the heart of the city houses a stunning collection of art from Africa and ranks as the first and largest major contemporary art museum on the continent. 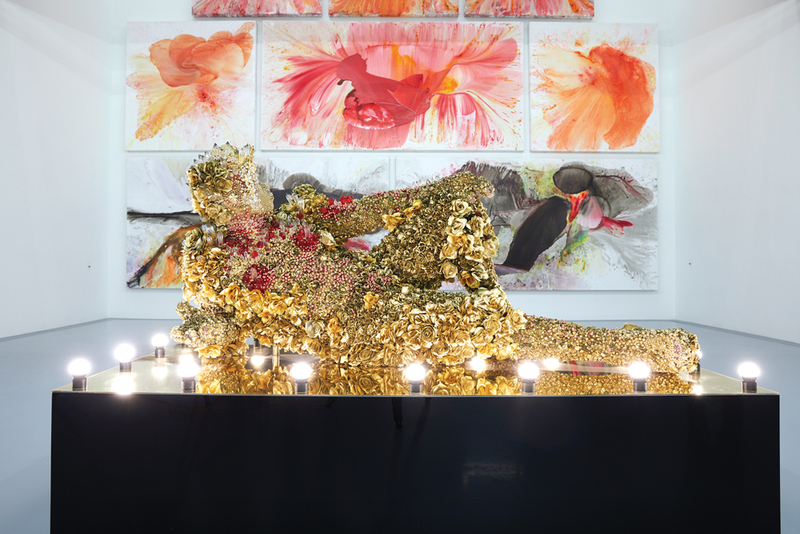 The Zeitz Collection, an accumulation of objects amassed by German businessman and African art lover Jochen Zeitz, forms the core while additional pieces and an influx of temporary exhibitions round out the offering. The works displayed challenge hackneyed notions of African art. Gone are stereotypical tribal clothing and ancient fertility talismans. In their place appear works by artists like Kenyan Cyrus Kabiru who photographs himself wearing outlandish self-made eyewear created with found objects—sort of a modern-day take on the traditional indigenous mask. Woven “fabrics” of discarded alcohol bottle caps and other detritus characterize the work of Ghanaian El Anatsui. And South African Athi-Patra Ruga’s large-scale, brilliantly colored photographs playfully depict individuals inhabiting a space between reality and fantasy. Contemporary art also plays a starring role at the Zeitz’s adjoining Silo Hotel, also new in 2017. Selected for Condé Nast Traveller’s 2017 “Hot List” and Lonely Planet’s “Top 10 Best New Places to Stay in 2018,” the Silo Hotel occupies an abandoned grain elevator. Multifaceted glass windows bulge out of the building’s industrial framework four stories above the museum and after dark they glimmer against the backdrop of matte concrete. Inside, the public spaces and guestrooms pop with contemporary African art, each piece hand-selected by hotel owner and art aficionado Liz Biden. Works created by young and aspiring artists hang alongside those of their well-established peers. These artists call Africa home and are connected by means of its diaspora. The photographs and paintings, works of glass and fabric were individually chosen to highlight the unique décor of each of the 28 guestrooms. 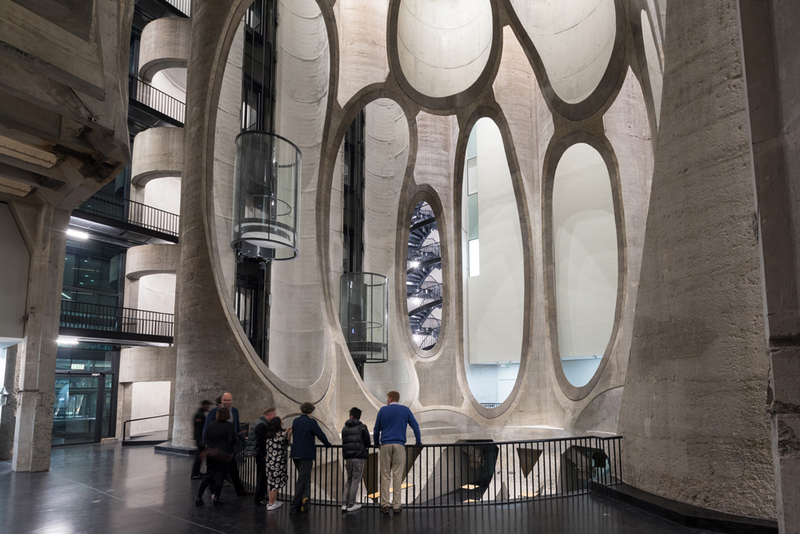 Below ground, the Silo bridges the gap between Cape Town’s new contemporary art museum and its local galleries in The Vault. The small gallery showcases works by Cape Town galleries that are available for purchase. 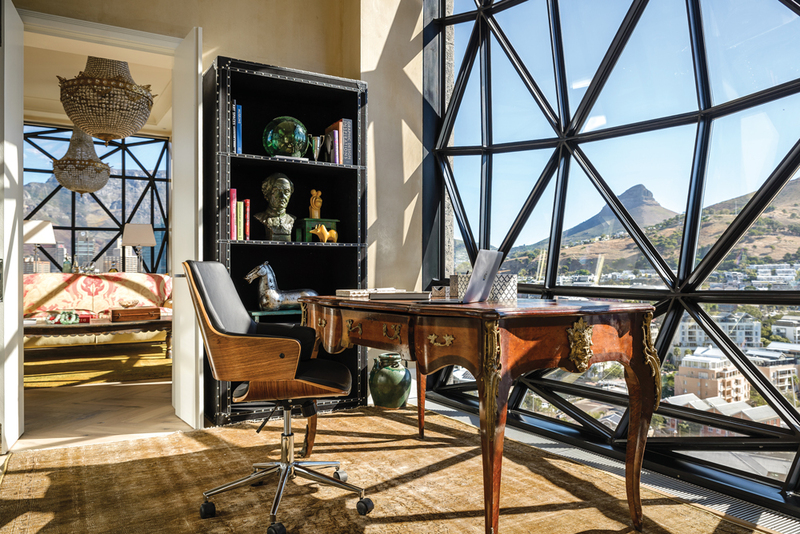 The Zeitz and the luxurious Silo Hotel form a new creative core in Cape Town’s Silo District. They are but a mere introduction to an enclave that buzzes with activity year-round. The most visited public pedestrian area in Africa is Cape Town’s V&A Waterfront. It draws visitors with dozens of harbor shops, foremost among them the Watershed where more than 150 artists display glass bead jewelry and batik textiles, traditional and contemporary ceramics and one-off necklaces and rings crafted of sparkling blue-violet African tanzanite. The country’s trendiest cultural destination is also its oldest city. 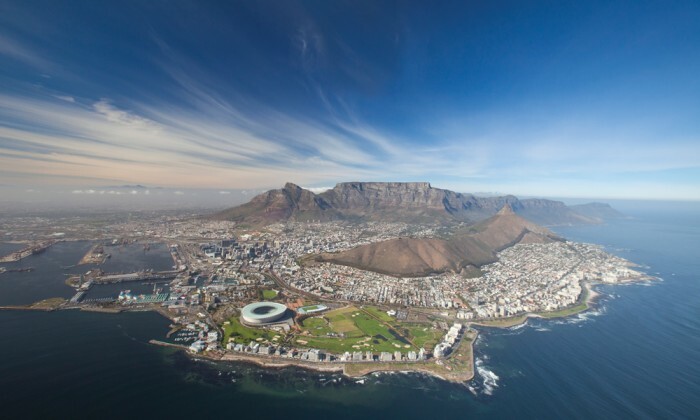 The Mother City, as she is known, was founded in 1652 when Jan van Riebeeck landed on this spit of land near the southernmost point of the continent. The Dutch navigator had a natural affinity for the Cape of Good Hope, which shielded oceangoing vessels from the punishing winds and surf of the South Atlantic Ocean. He immediately constructed a jetty and supply post for the Dutch East India Company, opening southern Africa to European trade and settlement. And while Cape Town’s footprint grew markedly from that 17th century wharf, the city’s waterfront remains a vital piece of its fabric. Commercial shipping is clearly visible at V&A Waterfront, just a stone’s throw from attractions like the Zeitz and the Watershed. Some of Cape Town’s most popular and inventive restaurants find a home at the V&A Waterfront, too. Within the Silo Hotel, the sixth floor Willaston Bar, named for the first ship to have exported grain from these silos in 1924, serves craft cocktails and indulgent bar snacks like polenta fries. Also within are the Granary Café (famous for its Sunday Roast offering of chicken, beef or pork) and the Silo Rooftop. Limited largely to hotel guests, the rooftop stuns visitors with its fabulous views. Enjoy cocktails and casual meals alongside a turquoise swimming pool while looking out at Table Rock National Park and the ocean. 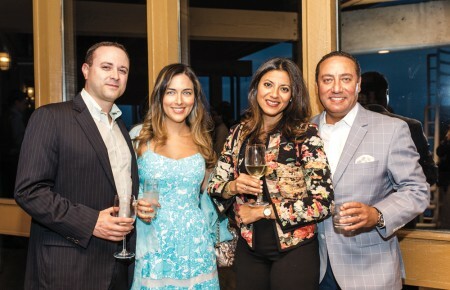 Other new dining options garnering praise include The Yard, a casual restaurant just steps from the waterfront serving an Indian-heavy menu. 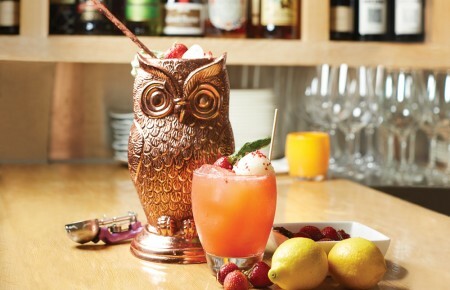 Next door, Si Cantina Sociale offers tapas-style dining. It’s worth taking a break from Cape Town’s waterfront to explore South Africa’s storied wine region. Set in an area tempered by Atlantic breezes, the vineyards roll across the hillsides like golden-green corduroy, producing award-winning vintages year after year. Groot Constantia winery stands as South Africa’s oldest wine-producing estate, with an uninterrupted history of winemaking since 1685. An orientation center recounts Groot Constantia’s 333-year-old history. Walk through the original Manor House and explore the cellar dating back to 1791 before tasting crisp sauvignon blanc, lightly-oaked chardonnay, rich cabernet sauvignon, shiraz and pinotage, a red wine that is South Africa’s signature variety. Grand Constance is the vineyard’s most famous wine. The red and white Muscat with caramel and honey notes has a long history among the world’s most famous oenophiles. Example: Napoleon is said to have requested a glass as his last wish before dying in exile on the island of St. Helena. After relishing the Zeitz and its galleries, spending an afternoon shopping for souvenirs and sipping the region’s finest wines, take a ferry trip across Table Bay. The 45-minute cruise docks at another historically significant locale: Robben Island, where Nobel Laureate Nelson Mandela was kept in an Apartheid-era prison for 18 of his 27-year incarceration. Visitors can take a guided 90-minute tour of the now UNESCO World Heritage Site and a landmark of racial injustice. Former inmates explain the life and hard labor they experienced on Robben Island as well as their personal memories of time spent with Mandela. They guide guests through prison yards, beneath guard towers and through empty cells ending with the one that housed the revolutionary. But Robben Island has a history that long predates the construction of South Africa’s most famous penal colony. Traveling by bus, visitors see the remains of an abandoned leper colony and World War II-era military barracks en route to the buildings that once housed South Africa’s political prisoners. On the journey back across Table Bay to Cape Town, it’s easy to imagine Robben Island’s last freed prisoners en route back to the Mother City in 1991. All of Cape Town is sprawled along the waterfront at the foot of Table Rock and the buildings take on a rosy glow in the late afternoon sunshine.